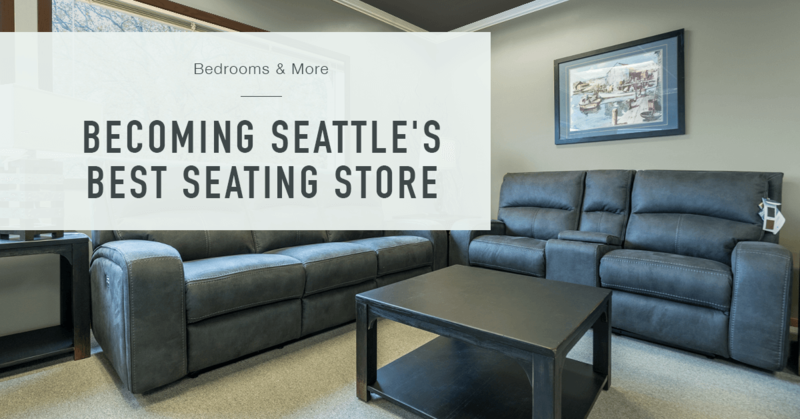 We have all of this extra space in our West Building, where we had mattresses and bedroom furniture before, that we have now turned into a seating store. It’s chock full of products to create a cozy living or guest room. When you step through the front door, you’ll notice our wool rugs from India. They have been sourced from India, where a 3rd generation family business like ours is creating elegant natural rugs, with terrific styles to choose from. If you didn’t notice the rugs first, then you definitely noticed our Stressless seating gallery by Ekornes. Norwegian luxury seating, with terrific support for anybody. Stepping down to the lower main level, you’ll see our sleeper sofas and sectionals by American Leather. They have the most comfortable, and easy to use sleeper sofas in the world; with great styles to choose from and a very quick turn around. On the floor above, where we created our following as the premier source of natural and organic beds, we have a FlexSteel seating gallery. It is full of sofas, recliners, and occasional furniture, including coffee tables, sofa back, and end tables. Adjacent to the FlexSteel product is a room full of motion recliners and media sofas by Fjords, a Stressless competitor. Rowe Furniture also has a very nice gallery of options on in our seating store. The sofas and sectionals by Rowe Furniture can be done with slipcovers, or without, and have much more fabric options than you thought you’d ever need. We still have a selection of futons. They’re a product that you may love to hate or hate to love, but we can’t deny their functionality. We may be one of the last futon resources in our region, and we are trying to become the best all-around seating store. Your best resource for natural mattresses and more has just expanded. Our footprint in Wallingford is a whole lot more than 5500 square feet now. At over 23,000 square feet, in a building designed by Stuart Silk Architects, we have five additional floors of mattresses, bedroom furniture, and rugs. When you enter our new building, the scale of the space is vastly different from the tiny corner store feel on the opposing corner. With vaulted ceilings, wood paneling, and exposed beams give a feeling of warmth, accentuated by natural light shining through picture windows. As your eyes track up, and over, you can’t help but notice our acacia wood stairs, bookcases, and handrails leading down to the basement full of youth furniture and an assortment of pillows and bedding, or up to the 2nd and 3rd floors, where we have sheets, other bedding, and mattresses. Floors 3 and 4 have bed frames, our famous two-sided mattresses, and loads of solid wood furniture pieces. A pair of the highlights on the fourth floor is our premium mattress brands ViSpring and Hästens. From the Hästens mattresses gallery, you’ll get a fantastic look at downtown Seattle, Lake Union, and on a clear day, Mount Rainier. Our commitment to durable comfort, in mattresses and bedding, has never changed; selling exclusively two-sided flippable mattresses (proven to last 3 times as long as one-sided mattresses) will always be our mode of operation. That philosophy applies to all of our new products as well and there are lots of new products. This entry was posted in Furniture, Mattresses Seattle, Seating. Bookmark the permalink.